The Womens TYR Hurricane Category 2 wetsuit has alot of the advanced features to maximize performance that it more expensive competitors have. The all new women's Category 2 wetsuit is constructed with Slick Skin Neoprene, which is perfect for beginner and intermediate triathletes, since it boasts minimal drag and maximum speed and durability in it's class. Showcasing Free R.O.M. (Range or Motion) Zones, the womens Cat 2 wetsuit eliminates constriction, allowing the swimmer to achieve a long reach without placing strain on the shoulder, while formfitting wrist cuffs keep water from entering the suit. Engineered for triathletes, Quick Release Ankle Cuffs allow for quick and effortless removal during T1 and strategic Speed Wrap Paneling placed throughout the leg, chest and core give you the feeling of a second skin, while maximizing body position and minimizing drag. 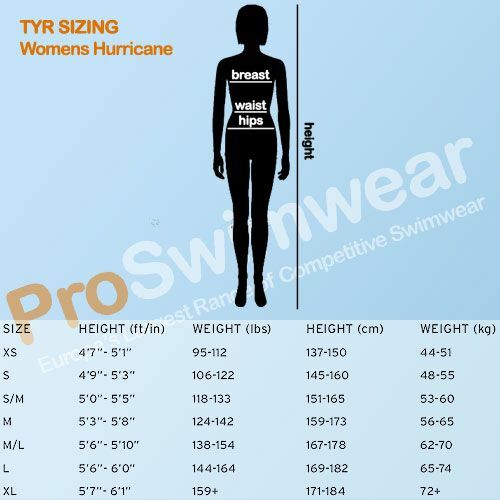 The Women's TYR Hurricane Category 2 wetsuit has alot of the advanced features to maximize performance that it more expensive tri wetsuit's have. The all new women's Hurricane Cat 2 wetsuit is constructed with Slick Skin Neoprene, which is perfect for beginner and intermediate triathletes, since it boasts minimal drag and maximum speed and durability in it's class.